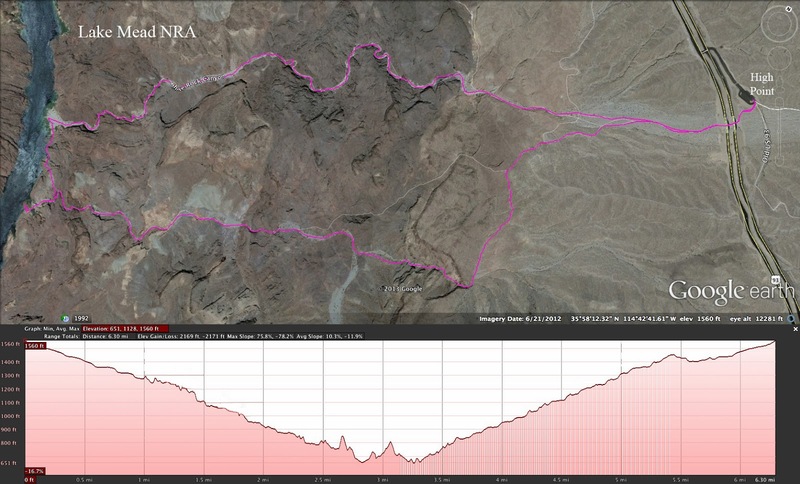 When twenty-nine hikers arrived at the trailhead for Arizona Hot Springs this morning, they thought the harsh wind storm would be the driving force of the hike. Instead, the weather became a non-issue and fun was the story. 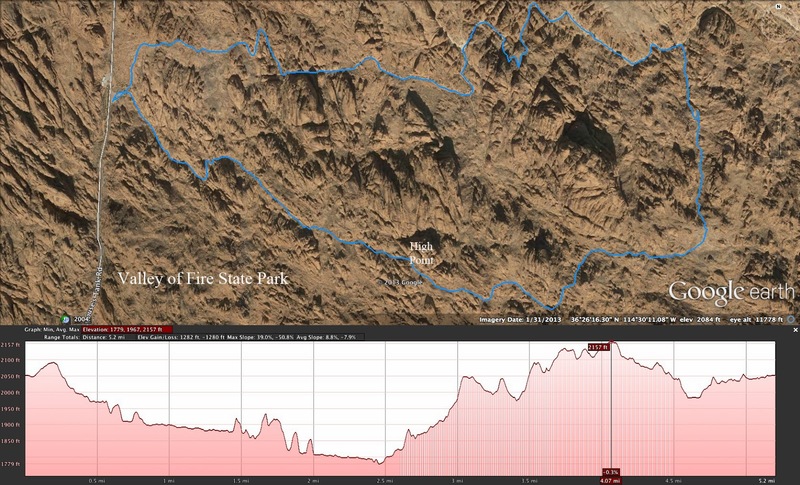 The trailhead is located 4 miles into Arizona from the Hoover Dam Bypass bridge on Highway 93. A left turn labeled as "White Rock Canyon Trailhead" brings drivers to a large parking lot where we began our hike by dropping down underneath the highway bridge. Our three mile hike down through White Rock Canyon went swiftly with only 3 or 4 stops for the end of the line to catch up. The hiking was easy in the loose gravelly wash. Every twist and turn was picture perfect as the walls grew higher and higher. 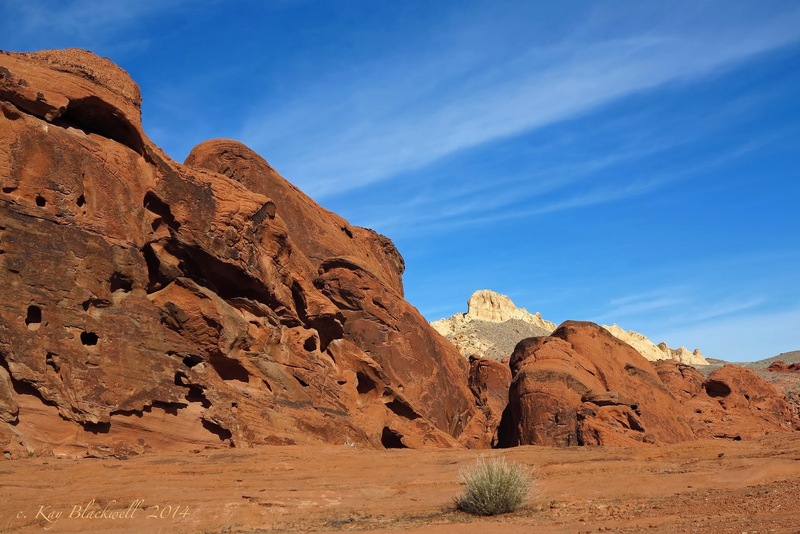 The canyon received its name because of the many white granite boulders strewn about the wash. Since the walls are of an igneous nature, the granite must have washed down from the Wilson Range mountains in the distance after eons of flash floods. 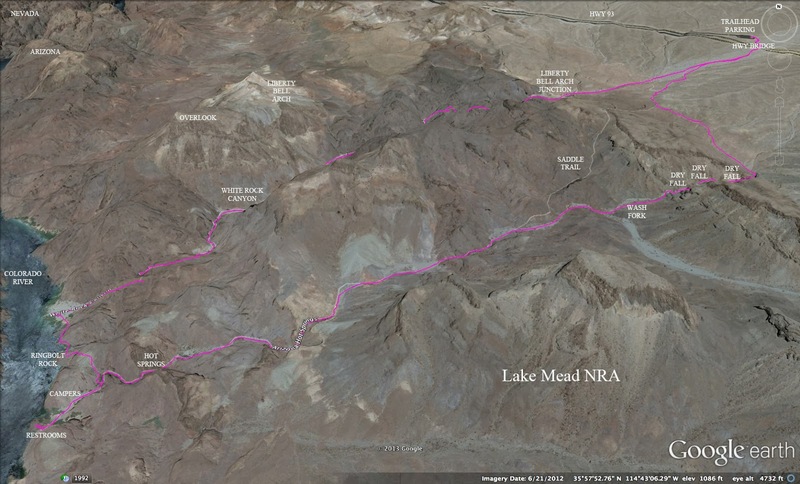 Before we knew it, we were at the Colorado River's edge. The trail turns to the left and we continued out to a rock outcropping above the river called Ringbolt Rock. Interestingly, Arizona Hot Springs are also called Ringbolt Hot Springs and the river rapids in this location are called Ringbolt Rapids. The ringbolt screwed into the tip of this rock is one of the ringbolts used between 1865 and 1890 to winch steamboats through the rapids. Past this overlook, the trail continues down river for a quarter mile climbing up and over a small ridge to drop down into the next canyon. From here, go back down to the river for a break. There are pit toilets and rocks to rest on. We took our break here where there were several empty tents and kayaks and a tent sitter. The tent sitter serenaded us with singing to his guitar playing but we would have preferred quiet. Anyway, after our break, we headed up the canyon into the hot springs stream that covered the narrow gravel wash. Some of us had already changed into our water shoes. Others waited to change at the top of the ladder. The climb through the lower hot springs canyon was easy even though care had to be taken going up the slippery stone next to the water. When we reached the twenty foot ladder below the pools, we didn't hesitate to begin the climb. The water flow was heavy and as you climbed, you got a small shower of warm water in your face! At the top of the ladder, there is a space dry enough to make shoe and pants changes. Once ready, twenty-nine hikers waded into the pools one by one. There was no better way to get from one end to the other. As we waded through the hot water, sounds of joy came from every direction. We had a lot of fun looking a little silly in our water wear or getting our hiking clothes completely wet up to the top of our thighs. For some, the deepness of the third pool felt wonderful and was a surprise even when we were expecting it! The slippery climbs between pools were awkward in our water shoes but we all made it through the canyon without taking a dive. There was a considerable wait at the other end of the pools while everyone completed the "swim" and made their change in clothing again. Nevertheless, there was a lot of good humor going around today as portrayed by the hikers seen in the photo to the left who were waiting to make the final climb out of the hot pool area. After twenty-nine hikers emerged from the canyon, we began our hike up through the wash we were now in. This canyon wash runs basically parallel to the White Rock Canyon wash. It is also covered with loose gravel but there are more places where you can avoid it. The geology of this canyon is slightly different in color and there are some interesting small obstacles, dry falls, that you have to climb up. 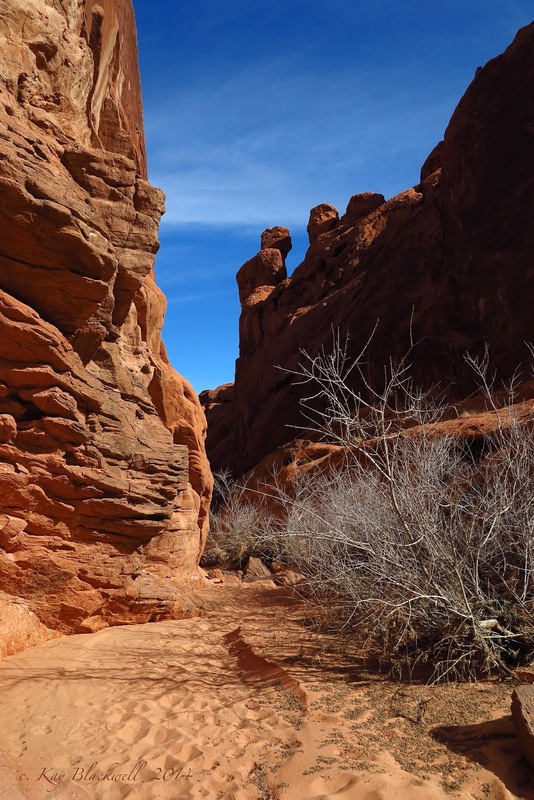 Several times, there is a short cut trail that you can take to cut corners in the wash. Soon, we were passing by the left turn of the saddle trail that is well marked by a tall cairn. We continued up the wash we were in. What was special about today's hike on the hot springs loop was that we set out to take the petroglyph / dry falls portion of the original hike. This part of the trail was "normal" before the saddle trail was made to avoid the treacherous dry falls up canyon. Bravely, we trudged on up the wash taking the left fork of a very wide large fork area in the washes as seen in the photo above. If you aren't paying attention, you might continue around to the right fork. Make sure you go left! We continued stopping to wait a few times for the last of the line to catch up. They weren't that far and we enjoyed the rest! The next point of interest is the area of petroglyphs. We didn't waste much time inspecting the ancient native writings but apparently there were several panels around that we did not pass by. There was also a group of college students taking a break here. They looked like they could be the ones who were camping down at the river. With the magic of Photoshop, the petroglyphs appear pristine. They are not! The first dry fall that was of any consequence was considered the "warm-up." Most of us chose to climb up the easier, less slippery wall to the right. A rope was taken out to help with a few of the hikers as well. Next came the first major dry fall as seen to the left and below. In the end, this was probably the most difficult even though it wasn't the tallest. Ropes helped on this one, too. Next, the front of the line moved on up to the last and tallest dry fall while the back of the line were continuing to make the previous climb. This dry fall is best dealt with by going up and around starting about thirty feet before the actual dry fall alcove. Although there is a lot of exposure, there are also a lot of hand holds and foot holds to make you feel secure. As each hiker arrived over the crest, looks of relief and joy were heavily written on their faces. It was a great sense of accomplishment for many of us. After a long wait for everyone to make it up, we proceeded out of the canyon. The trail takes you over land, connects with the other side of the saddle trail then takes you on up to the trailhead. Okay. Now the wind storm can continue! 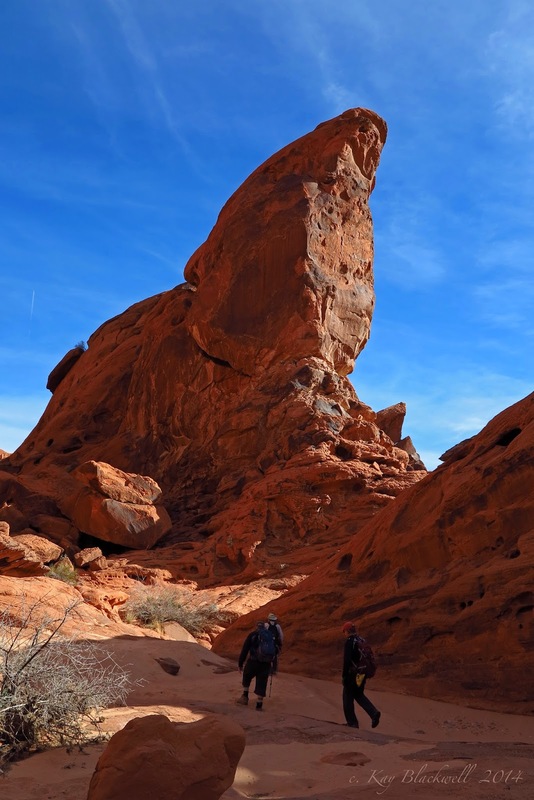 The hike today took us up to Valley of Fire State Park for a 5 mile loop hike full of scrambling and "kung fu hiking." The Around the Bend Friends joined forces with the Lone Mountain Hiking Club and Brian found himself in charge of thirty-two enthusiastic hikers. We began at the Mouse's Tank turnout off of Valley of Fire's Mouse's Tank Road, the scenic road that cuts through the park from south to north. 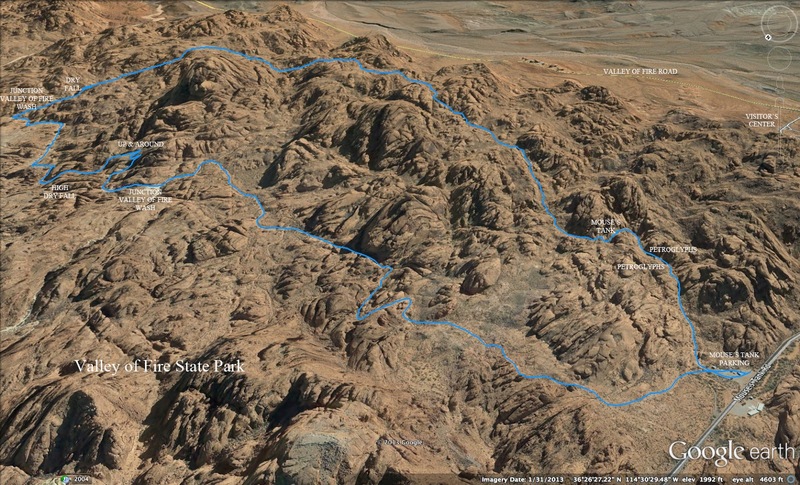 We headed off into the red rock to the north (left) of the regular trail to the tank area. We immediately enjoyed a scramble drop down the red rock ending in a tight brushy wash. The kung fu hiking technique served us for almost half the hike as we walked through the wide Valley of Fire sandy washes. There were many footprints in the sand and not all of them were made by humans. Bighorns, coyotes, kangaroo rats and even a mountain lion had crossed the wash in recent days. At one point, we had to do an "up and around" to bypass a particularly tough dry fall in the wash. Finally reaching the escape junction, we turned right out of the sand and began a climbing scramble up a gentle slope. As we hiked, it was difficult to keep our attention on the trail. There were so many interesting rock formations everywhere we looked. At the end of a steep climb, we stopped for our snack break. We had a partial view of the Painted Pinnacles in the distance. After our break, we proceeded across a large relatively flat area then dropped down a little only to begin another climb. The hike continued like this, up, down, up, down for another mile or two. Every time we got to the top of a climb or rounded a non-obvious corner, we would stop and wait for the tail end of the line of thirty-two to come into sight. While waiting, we would enjoy the view, do a short exploration or simply sit and drink water. There was a lot to be said for just enjoying being out in the fresh air. By now, we were well on our way back toward Mouse's Tank and the cars. 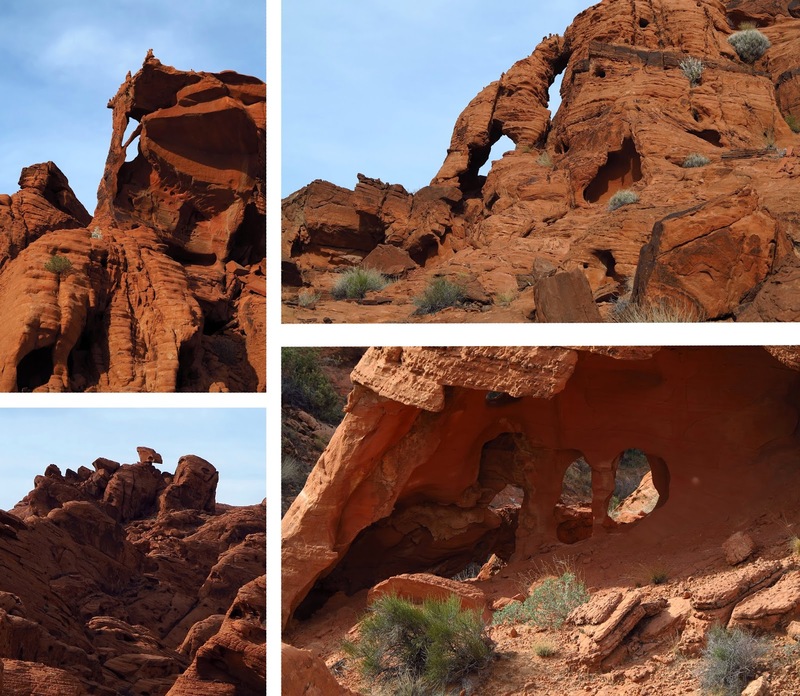 In this section, there were many interesting arches and windows in the red rock. We would grab our photos quickly when we were on the go! Although we looked all morning, we never saw any of the wildlife that were evident by the sand tracks. The green brush was accented by the red rock and the smell of mormon tea (ephedra) permeated the air as we walked by the plants. Everyone was doing a great job of handling the challenges and the route was finally leading us down into the wash below the Mouse's Tank area. Paul scrambled up a rock while waiting for the back of the pack. Hikers could be seen through a rock window at the side of the trail. We made our way through the wash to the bottom of Mouse's Tank's overflow. There was a steep but short up and around then we inspected Mouse's Tank from above as seen to the left. Several panels of petroglyphs lined the walls of the sandy wash on the way out to the parking lot. We passed several tourists who wondered where in the world we had come from.